The evolutionary mechanisms involved in shaping complex gene regulatory networks (GRN) that encode for morphologically similar structures in distantly related animals remain elusive. In this context, echinoderm larval skeletons found in brittle stars and sea urchins provide an ideal system. Here, we characterize for the first time the development of the larval skeleton in the ophiuroid Amphiura filiformis and compare it systematically with its counterpart in sea urchin. We show that ophiuroids and euechinoids, that split at least 480 Million years ago (Mya), have remarkable similarities in tempo and mode of skeletal development. Despite morphological and ontological similarities, our high-resolution study of the dynamics of genetic regulatory states in A. filiformis highlights numerous differences in the architecture of their underlying GRNs. Importantly, the A.filiformis pplx, the closest gene to the sea urchin double negative gate (DNG) repressor pmar1, fails to drive the skeletogenic program in sea urchin, showing important evolutionary differences in protein function. hesC, the second repressor of the DNG, is co-expressed with most of the genes that are repressed in sea urchin, indicating the absence of direct repression of tbr, ets1/2, and delta in A. filiformis. Furthermore, the absence of expression in later stages of brittle star skeleton development of key regulatory genes, such as foxb and dri, shows significantly different regulatory states. Our data fill up an important gap in the picture of larval mesoderm in echinoderms and allows us to explore the evolutionary implications relative to the recently established phylogeny of echinoderm classes. In light of recent studies on other echinoderms, our data highlight a high evolutionary plasticity of the same nodes throughout evolution of echinoderm skeletogenesis. Finally, gene duplication, protein function diversification, and cis-regulatory element evolution all contributed to shape the regulatory program for larval skeletogenesis in different branches of echinoderms. The genome is a biological instruction manual and its regulatory program is executed by large gene regulatory networks (GRN) that causally explain the connection between genotype and phenotype. Body plans and complex morphological structures arise during embryogenesis and rely on the expression of a distinct array of regulatory genes (i.e., genes encoding transcription factors (TF) and proteins of signaling pathways). Understanding how developmental GRNs change during evolution will directly contribute to addressing the fundamental question of how specific DNA sequence variations lead to different morphologies. In development, GRNs describe the progression of regulatory states (generated by a unique combination of transcription factors) in embryonic space and time, necessary to specify different cell types present in a multicellular organism [1, 2]. Although many studies in different organisms have analyzed complex developmental GRNs [1, 3–5], little is known about the mechanisms of rewiring during evolution, and most studies, with few exceptions [6–8], remain at the level of single nodes. Comparative analyses in the past two decades suggest that phenotypic differences between organisms are achieved mostly through variation in the expression of developmental regulatory genes . Therefore, changes in the cis-regulatory apparatuses that control gene expression act as the main mechanism of GRN evolution [1, 8–13]. Alterations in cis-regulatory elements represent only one aspect of GRN evolution. Important evolutionary changes of transcription factors have been reported also at the level of functional domains and binding specificity (for review [14, 15]). Echinoderms and their calcitic endoskeleton provide an ideal system to study mechanisms of GRN evolution due to the extensive knowledge of GRNs for several sea urchin species [2, 16–19]. In the euechinoid sub-class of sea urchins, the cells producing the larval skeleton are precociously segregated at early cleavage stage in the form of four small cells at the vegetal pole (large micromeres). At this stage, the skeletogenic program is strictly activated by a cascade of localized repressors (pmar1 and hesC), the so-called double negative gate (DNG), which allows the expression of a cohort of regulatory genes in these cells. The activated regulatory genes are precisely wired to ensure progression of the genetic program up to the expression of the differentiation genes, which produce the bio-mineralized skeleton of the pluteus larva [2, 16, 17]. Recent studies on the Cidaroidea sub-class of sea urchins, which also develop a larval skeleton showed, however, major differences in the initiation of the skeletogenic GRN and can be summarized as follows: (1) the absence of a clear precocious segregation of the skeletogenic lineage at cleavage stage; (2) the absence of a clear pmar1 or similar functioning gene; and (3) the variability of expression and function of hesC in different cidaroid species [18, 19]. Furthermore, a clear delay in the ingression of the skeletogenic cell lineage at late gastrula stage is characteristic of the cidaroid skeleton development . Little is known about the rest of the network components and linkages in cidaroid sea urchins. Of the five extant classes of echinoderms, only echinoids (sea urchins) and ophiuroids (brittle stars) develop an elaborated larval skeleton. A gene expression study of sea urchin and sea star adult skeletogenesis hypothesized that sea urchin larval skeleton originated by co-option of an existing regulatory module into a new developmental context . An open question remains: how did the brittle star larval skeleton originate? To address the directionality of evolutionary changes, the phylogenetic relationship of echinoderm classes is of paramount importance. While morphology and molecular analysis agree on a monophyletic group of asteroids, ophiuroids, echinoids, and holothurians (the Eleutherozoa), molecular evolution studies sustain two alternative positions of the ophiuroids within the Eleutherozoa: (1) sister group to asteroids [22–25] or (2) sister group to echinoids plus holothurians . Although this question is still debated, four recent independent studies showed clear support for ophiuroids as sister group to asteroids [22–25]. Independent of their phylogenetic relationships, it is clear that ophiuroid and echinoid lineages split around 480 million years ago (Mya) [23, 26] and the comparison of development of the larval skeleton will highlight changes and conservation of the GRN responsible for the formation of this complex structure. Additionally, these studies may help elucidate the common or independent origin of the pluteus larvae and their extended skeleton in echinoids and ophiuroids, a question still subject to debate. The brittle stars (Ophiuroidea), along with sea lilies (Crinoidea), are the least studied class of Eleutherozoa for molecular aspects of their development. This is largely caused by experimental difficulties, mostly due to the inability to control oocyte maturation , a short spawning season, a small number of gametes per adult, and an often deep-water habitat. Furthermore, so far no functional experiments have been successfully performed, making this system extremely challenging. The few studies that have been performed on brittle star development are scattered among various species. Although superficially similar to the sea urchin pluteus larva, the embryo of ophiuroids differ in the lack of micromeres  and the pluteus shows greater sensitivity to ocean acidification . On the other hand, a transcriptome analysis identified several ophiuroid orthologs of sea urchin skeletogenic genes , and expression of ets1/2, vegfR, and vegf regulatory genes [31, 32] showed remarkable resemblance to sea urchin, suggesting a similar molecular make-up of the skeleton. While brittle stars are experimentally challenging, their key phylogenetic position is ideal to answer important questions about the evolution of the skeleton in echinoderms and the corresponding regulatory network encoding it. Here, we are using a multi-gene approach to compare development and gene expression between the brittle star Amphiura filiformis (Afi) and the sea urchins, using mainly, but not exclusively Strongyloncentrotus purpuratus (Spu) as an entry to understand GRN evolution . 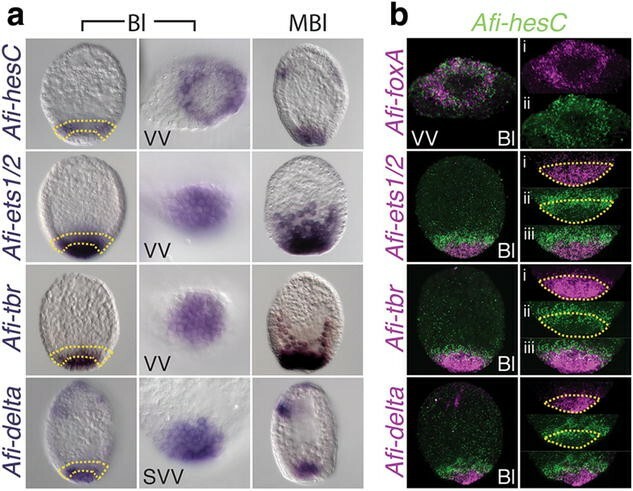 Detailed characterization of A. filiformis development identified a group of cells marked by a skeletogenic molecular signature emerging as early as blastula stage. Our data show major changes in the initiation of a specification network subcircuit (i.e., the pmar1/hesc double negative gate) as well as the complete absence of expression of late regulatory genes (foxb and dri) in A. filiformis, and the heterochronic change in the expression of several other genes. In summary, these data indicate major differences in GRN architecture for larval skeletogenesis in these two classes, which suggest that gene duplication, protein function diversification, and cis-regulatory elements evolution all contributed to shape the regulatory program for larval skeletogenesis in different classes of echinoderms. In this study, we compare development and gene expression between the brittle star Amphiura filiformis and indirectly developing echinoids with elaborated skeleton [2, 18, 19]. To understand larval skeletogenesis in ophiuroids, we first analyzed the tempo and the mode of A. filiformis development, providing the most complete picture of ophiuroid development to date (Fig. 1). A. filiformis differs from euechinoid sea urchin development in the lack of micromeres at the vegetal pole (Fig. 1a, 6hpf), and in the early appearance of morphological evidence for animal–vegetal and oral–aboral axes (Fig. 1a, 16hpf and 23hpf). The fertilized egg undergoes 8 rounds of cleavages in the first 10 h of development producing a blastula of approximately 250 cells with a clearly visible blastocoel and still encased in the fertilization membrane (Fig. 1a, 10hpf ). Immediately after hatching (Fig. 1a, 16 hpf), the embryos elongate along the animal–vegetal axis and the cells in the vegetal half are distinctly thicker than the ones in the animal half. At the beginning of gastrulation (Fig. 1a, 27 hpf), A. filiformis embryos flatten along the oral–aboral axis. Furthermore, morphogenetic movements occur at a faster pace, although following a similar sequence of events (Fig. 1). Despite these differences, in both organisms skeletogenesis is preceded by the ingression of mesenchymal cells prior to gastrulation (Fig. 1a, 23 hpf), and the two bilaterally arranged spicules are formed just underneath the ectoderm within two clusters of mesenchymal cells located at the boundary with the invaginating endoderm as identified by calcein staining (Fig. 1a, 30 hpf) (for comparison with sea urchin see ). Skeleton-specific genes, therefore, should be expressed in the cells tightly associated with skeletal elements in the two lateral patches of the A. filiformis gastrula where the spicules appear. We selected genes whose zygotic expression is present exclusively in skeletogenic cells throughout development in sea urchin and cloned their orthologs in Amphiura. These genes are encoding for transcription factors, such as alx1, jun [17, 34], and for differentiation proteins identified by proteomic studies in the bio-mineralized matrix of both larval and adult skeleton, such as p19, p58a and p58b [35–37]. Using whole mount in situ hybridization (WMISH), we observe their expression in the cells where A. filiformis skeleton primordia first appear (Fig. 1c). The expression of these genes remains associated only with the growing skeleton also later in development, as shown by the staining in the two mesenchymal clusters of cells at the base of the archenteron throughout gastrulation, where the skeleton becomes evident, and in a chain of mesenchymal cells distributed in a pattern that mirrors the elaborated skeletal structure of the pluteus (Additional file 1: Figure S1). Similar to sea urchin, these genes are exclusively expressed in cells surrounding the position of skeleton formation. Moreover, their co-expression over developmental time allows us to use their combination here as a marker for skeletogenesis. To establish the onset of expression of these skeletogenic lineage specific genes, we analyzed high-resolution time-courses using QPCR (Fig. 1b). Afi-alx1 and Afi-p19 start to be expressed at early blastula (12 hpf), while the maternally abundant Afi-jun decreases in the first 9 h of development until its zygotic expression is activated at 12 hpf (Fig. 1b). WMISH of Afi-alx1 at early blastula shows expression in 8 (±1) cells (n = 3) grouped together on one side of the embryo (Fig. 1c, Additional file 1: Figure S2) and is later expressed in 18 (±3) cells (n = 17) in the vegetal plate of the late blastula (Fig. 1c). Importantly, none of these three genes show any localized expression at earlier stages of development (Additional file 1: Figure S2), consistent with the QPCR data. At early blastula stage, next to similar cell counts, double fluorescent in situ hybridization (FISH) shows complete co-expression of Afi-alx1 and Afi-p19 (Additional file 1: Figure S2C). At mesenchyme blastula stage staining for these genes, as well as Afi-p58a and Afi-p58b, is detected only in the mesenchymal cells ingressing first, and later at gastrula stage in cells surrounding the position of calcium carbonate deposition (compare Fig. 1a, c). Taken together these high-resolution expression data suggest that, as in euechinoids, the primary mesenchyme cells might be the precursors of the skeletal cells and are here referred to as skeletogenic mesodermal cells (SM). These data also identify a specific regulatory program already present at blastula stage in a subset of the vegetal cells of the A. filiformis embryo. This is characterized by the presence of the transcription factors Afi-alx1 and Afi-jun and their co-expression with the differentiation genes Afi-p19, Afi-p58a and Afi-p58b for which sea urchin orthologs are participating in the formation of the bio-mineral matrix of the skeleton. The exact function of these genes in A. filiformis development and their role in the formation of the skeleton need to be tested in knock-down experiments in future investigations. In euechinoid sea urchin, the skeletogenic program is initiated by the zygotic expression of the paired-like homeodomain transcriptional repressor pmar1/micro1, which starts to be expressed only in micromeres as early as 4th cleavage [38, 39]. Pmar1 dominantly represses the globally expressed hesC and separates the skeletogenic lineage from the rest of the embryo forming the first element of the DNG (Fig. 2c). A potential brittle star pmar1 has been mentioned in the study of the Ophiocoma wendtii developmental transcriptome . Using a reciprocal blast approach in an A. filiformis developmental transcriptome, which includes four developmental time-points from cleavage to gastrula stage, we identified a sequence with closest similarity to Spu-pmar1c, here referred to as Afi-pplx. We validated its true evolutionary relationship with the pmar1 genes through maximum likelihood and bayesian phylogenetic trees in the context of several classes of paired-like homeodomain (HD) sequences identified in different echinoderms and non-vertebrate deuterostomes. Using an alignment of the HD alone and independent of methodology, Afi-Pplx always grouped with good support as sistergroup of euchinoid Pmar1/Micro1 transcription factors (posterior probability of 0.93 and bootstrap of 63; Fig. 2a, Additional file 1: Figure S3A, C). On the other hand, the inclusion of other conserved domains in our analysis of the Pmar1/Micro1 proteins (i.e., engrailed repressor domains, eh1), resulted either in a highly supported polychotomy of Afi-Pplx, Phb1, and Pmar1/Micro1 genes using Bayesian inference (posterior probability 0.99; Additional file 1: Figure S3B) or in a low supported independent grouping of Afi-Pplx with brittle star and sea star (Patiria miniata, Pmi) Phb1 genes, whereas Pmar1/Micro1 genes group with Spu-Phb1 (bootstrap <60; Additional file 1: Figure S3D). Interestingly, all trees supported a monophyletic grouping of Afi-Pplx with Phb1 and Pmar1/Micro1 genes with high confidence (posterior probability 0.99 and bootstrap >83; Fig. 2a, Additional file 1: Figure S3). For this reason, we decided to name the Afi gene pmar1-phb1-like-homeobox (pplx). Interestingly, we were unable to find any close pmar1 hit in the available cidaroid (Eucidaris tribuloides), sea star (Patiria miniata) and hemichordate (Saccoglossus kowalevskii) genomes, although a phb1-related sequence was present. Our phylogeny clearly reveals (1) the phb1 and the pmar1 + pplx1 genes form a strongly supported distinct class of paired-like homeodomain; (2) the long branch to the euechinoid pmar1/micro1 genes and the absence of a clear cidaroid pmar1 gene suggest a recent evolution of these genes only in euechinoids; and (3) in euechinoids the pmar1 genes have been extensively duplicated. Importantly, the temporal and spatial expression of Afi-pplx is highly similar to the sea urchin Spu-pmar1 (Fig. 2b, c). Afi-pplx is transiently expressed only in the zygote, starting its expression at late cleavage in a group of 10 (±3) cells (n = 7). It has a maximum level of expression at early blastula, when it is expressed in 20 (±5) cells (n = 4), then in 35 (±6) cells (n = 7) at the vegetal plate, to drop down to undetectable levels by mesenchyme blastula (Fig. 2b, c). It is important to notice that the number of cells expressing Afi-pplx at blastula stage is twice as much as the number of SM cells marked by Afi-alx1. A detailed analysis of protein domains using sequence comparison revealed that Afi-Pplx lacks two eh1 motifs, which are necessary for the Spu-Pmar1 repressive function . It has been shown that this short protein motif can easily be acquired and lost throughout evolution . In Afi-Pplx, moreover, amino acid (aa) 50 of the homeodomain, known as the recognition aa, is an H instead of a Q (Additional file 1: Figure S4A). On this basis, we hypothesize that Afi-Pplx is not functionally similar to Spu-Pmar1 and unlikely acts as transcriptional repressor, despite a similar domain of expression. To test this, we injected sea urchin fertilized eggs with equimolar amount of a synthetic mRNA encoding for Afi-Pplx and Spu-Pmar1 as already described . We also injected a GFP only as negative control for injection artifacts (Spu-5′pmar1-gfp; Fig. 2e, Additional file 1: Figure S4) and controlled for correct translation of the synthetic Afi-pplx mRNA using a fusion with GFP (Afi-pplx-gfp; Additional file 1: Figure S4A), which indeed is translated and localized in all nuclei of the sea urchin embryos (Additional file 1: Figure S4 B). Whereas ectopic expression of Spu-pmar1 leads to the re-specification of every cell of the embryo to a skeletogenic fate , ectopic expression of Afi-pplx does not show any re-specification of cells towards the skeletogenic fate, as shown also at molecular level with the lack of expansion of Spu-delta expression (Fig. 2e). To better characterize at molecular level the effects of Afi-pplx injection on the sea urchin skeletogenic program and exclude any potential compensatory effects, we quantified the level of expression of ten sea urchin skeletogenic genes, using QPCR, in Afi-pplx- and Spu-pmar1-injected embryos and compared them with GFP-injected controls. The sea urchin genes analyzed include all the immediate downstream genes of the double negative gate (Spu-delta, Spu-tbr, Spu-ets1/2, and Spu-alx), as well as late specification genes (Spu-foxb), signaling receptor (Spu-vegfr), and skeleton matrix genes (Spu-sm50, Spu-p19, Spu-p58a, Spu-p58b). In agreement to what has been already published by , the Spu-pmar1-injected embryos show upregulation of all skeletogenic genes above threshold levels (ΔΔCt > 1.6); on the contrary, Afi-pplx-injected embryos show little or no effect on all genes analyzed (Additional file 1: Figure S4F). Our results indicate that Afi-pplx is not capable of repressing the Spu-hesC gene and, thus, operates differently from Spu-pmar1. Interestingly, ectopic expression of Afi-pplx-mRNA shows specific and reproducible phenotypic effects on the development of the S. purpuratus skeleton at a later stage (Additional file 1: Figure S4D, E). This could be the result of Afi-Pplx having an activator function, opposite to Pmar1 repression, or a consequence of different interactions of these two transcription factors with other regulatory partners and/or cis-regulatory sequences. In summary, these data suggest that although Afi-pplx is expressed in a very similar spatio-temporal pattern of Spu-pmar, it might provide a different regulatory function in the brittle star skeletogenic program. In euechinoids, the second element of the DNG consists of the globally expressed gene hesC, which is excluded from the skeletogenic lineage by the repressive action of Pmar1. HesC directly represses a cohort of genes encoding for TFs (ets1/2, alx1, tbr, and soxC) and signaling molecules (delta) [2, 38, 42]. This cohort of genes will drive forward the skeletogenic program up to the activation of differentiation gene batteries (Fig. 2d) . On the contrary, in cidaroids a great variability in the expression and function of hesC has been recently reported [18, 19]. Although we showed that Afi-pplx is probably not working as a repressor and thus is not part of a DNG logic, we cannot exclude that Afi-hesC might still spatially restrict the expression of the same downstream genes via its repressive action. Therefore, we cloned and analyzed the spatio-temporal expression of Afi-hesC and its immediate downstream genes Afi-ets1/2, Afi-alx1, Afi-tbr, and Afi-delta. At the aa level, Afi-HesC shows conservation of all its distinctive domains, including the VRPW repressor domain, making it likely to retain a transcriptional repressor function. Afi-hesC is not detectable throughout cleavage stages (Additional file 1: Figure S5A), and begins to be expressed at blastula stage in a ring of cells towards the vegetal pole (Fig. 3a), thereby acting as a local rather than a global regulator. Importantly, A. filiformis orthologs of the DNG downstream genes, tbr, ets1/2, and delta, are partially co-expressed with Afi-hesC (Fig. 3b) at blastula stage. This co-expression becomes even more extensive at mesenchyme blastula stage, when Afi-hesC occupies the vegetal plate together with ets1/2, delta, and tbr, making a repressive action of Afi-HesC on these genes highly unlikely (Fig. 3a). Furthermore, double FISH shows complete co-expression of Afi-hesC with Afi-foxA at this stage (Fig. 3b), while at mesenchyme blastula stage Afi-hesC will occupy the center of the vegetal plate delimited by a ring of Afi-foxA expressing cells (Fig. 3, Additional file 1: Figure S6). In sea urchin, the Spu-foxA gene is initially expressed in the entire endomesoderm territory apart from the SM lineage, while later in development it gets restricted specifically to the endoderm lineage only . Double FISH shows that Afi-pplx, Afi-ets1/2, Afi-tbr, and Afi-delta are all expressed in a larger domain than Afi-alx1 (Fig. 3, Additional file 1: Figure S7), a result additionally supported by the counts of positively labeled cells in several embryos. At blastula stage, Afi-ets1/2 is expressed in 32 (±2) cells (n = 6), Afi-tbr in 40 (±3) cells (n = 5), and Afi-delta in 32 (±3) cells (n = 5), which indicates that they are likely expressed in the whole mesoderm and possibly partially in the endoderm territories and are not restricted only to the skeletogenic precursor cells marked by Afi-alx1 18 (±3) cells (n = 17) as in sea urchin. This is consistent also with the earlier expression of Afi-delta and Afi-pplx in a wider domain of 20 (±5) cells (n = 5) compared to 8 (±1) cells (n = 2) of Afi-alx1 at early blastula (Additional file 1: Figure S5). Afi-HesC, however, could still repress Afi-alx1 into a small domain in the center of the vegetal plate of the blastula. Assuming that Afi-HesC is the main direct repressor of Afi-alx1 in the vegetal plate, as shown in euechinoid and in a species of cidaroid sea urchins (S. purpuratus  and E. tribuloides ), the expression pattern of those genes should be mutually exclusive. The double FISH identifies some cells that do not express Afi-alx1 within the domain delimited by Afi-hesC, suggesting either a non-direct relationship between Afi-alx1 and Afi-hesC or the presence of another repressor of Afi-alx1 in these cells (Additional file 1: Figure S7). Altogether our analysis suggests the absence of a pplx/hesC DNG in brittle star as a mechanism of initial specification of the subdomain of mesoderm expressing skeleton-specific genes and is supported by the following: (1) Partial co-expression at blastula stage and complete co-expression at mesenchyme blastula stage of Afi-hesC with Afi-tbr, Afi-ets1/2, and Afi-delta support that the cis-regulatory apparatuses of these genes are insensitive to the repression by Afi-HesC and are thus different from euechinoid sea urchin. (2) Afi-pplx is expressed in 35 (±6) cells (n = 7) similar to Afi-tbr, Afi-ets1/2, and Afi-delta suggesting co-expression with Afi-hesC and, hence, the absence of a repressive action of Afi-pplx1 on Afi-hesC at this stage, consistent with the absence of known protein repressive domain. (3) The incomplete mutual exclusive expression of Afi-hesC with Afi-alx1 makes a role of Afi-hesC as sole repressor of Afi-alx1 unlikely. Downstream of the initial tier of regulation activated by the DNG, the sea urchin SM network is stabilized by an interlocking loop (IL) engaging the genes, tgif, erg, and hex in a recursively wired positive feedback loop . Interestingly, this IL is conserved in mesodermal cells of sea star, an echinoderm class that does not form any larval skeleton , suggesting an ancestral function not directly linked to larval skeletogenesis. In A. filiformis the genes Afi-tgif, Afi-erg and Afi-hex are expressed or enriched in a group of cells at the vegetal plate of the blastula, similar to sea urchin and sea star, but with the following differences: Afi-erg is expressed in a smaller domain nested within Afi-hex expressing cells; Afi-tgif is ubiquitously expressed at low levels and enriched only in the vegetal plate (Fig. 4a). This is consistent with a transient function of the IL in Afi-erg positive cells of the vegetal plate only at blastula stage. Whereas Afi-erg stays active in SM until gastrula stage (Fig. 4a, Additional file 1: Figure S8), Afi-hex is turned off from SM as soon as these cells enter into the blastocoel (Fig. 4a) and is unlikely to be a driver of skeletogenic genes at later stages. Importantly, at mesenchyme blastula stage these same three genes are now co-expressed in the vegetal plate, where the non-skeletogenic mesodermal cells (NSM) reside, and possibly reestablish the IL in these cells (Fig. 4a). Time-course comparisons between sea urchin and brittle star pinpoint differences of initial inputs responsible for the activation of these genes. In the only echinoderm species where the dynamic of gene expression is available, S. purpuratus, the three genes are activated in the following order: Spu-hex, Spu-erg, and Spu-tgif, in all cases needing the former for the activation of its subsequent. Conversely, in brittle star the order of activation is perfectly reverted (Fig. 4b) suggesting differences in initiation and potentially promoter logic of the IL in brittle star compared to sea urchin. It is important to notice that orthologs of the main drivers of the sea urchin and sea star IL genes, Tbr and Ets1/2, in brittle star are expressed not only in SM lineage, but also in a wider mesodermal area consistent with the expression of hex and tgif, but not erg. This implies that Afi-erg requires extra input(s) to be restricted to a subset of cells at blastula stage. These data are in agreement with an ancient pan-mesodermal role of the hex-erg-tgif IL, as seen in sea star , rather than performing a dedicated SM function as evolved in euechinoids. In sea urchin skeletogenesis, two extra TFs, foxB and dri, directly regulate the expression of some differentiation genes [44–46]. Spu-foxB is only employed during larval skeletogenesis in S. purpuratus, whereas Spu-dri is also expressed in an adult skeletogenic domain . In contrast, the brittle star orthologs of these are not involved in larval or adult skeletogenesis ( and unpublished data), as confirmed by WMISH and QPCR (Figs. 1b, 4). Finally, recent transcriptomic screenings in S. purpuratus [16, 48] identified three additional transcription factors as specifically expressed in skeletogenic cells during development, although little is known about their role in the GRN for skeletogenesis. These are Spu-nk7, Spu-alx4, and Spu-mitf. From quantitative transcriptome data available in the EchinoBase (http://www.echinobase.org/Echinobase/), it is evident that none of them is expressed before SM ingress into the blastocoel (24 hpf), and spatial data confirm the expression in primary mesenchymal cells only for Spu-nk7 and Spu-mitf [49, 50]. In sea urchin, Spu-nk7 is expressed in skeletogenic cells from mesenchyme blastula throughout development, suggesting a role in late skeletogenesis. To understand the potential role of these genes in brittle star, we surveyed our transcriptome data; we identified only Afi-nk7 and Afi-alx4, and analyzed the expression of Afi-nk7. This gene showed expression already at blastula in the vegetal plate and in the SM cells of the mesenchyme blastula stage, but it is absent from skeletogenic cells at later stages of development and during skeleton deposition (Fig. 4a). In summary, while the IL might still act in brittle star mesodermal cells, the late skeletogenic regulators, Afi-foxB and Afi-dri, are not responsible for driving the expression of any skeletogenic differentiation genes because they are never expressed at the analyzed stages (mitf) or never expressed in these cells (foxb and dri). Additionally, the expression of Afi-nk7 shows heterochronic expression between the two classes of echinoderms. A recent study showed conservation of the blastula mesodermal regulatory state among different classes of echinoderms, excluding brittle stars , although the relative positioning of the different mesodermal cells within the vegetal plate showed a certain degree of variation. To understand the timing of specification and the disposition of various mesodermal cells (i.e., skeletogenic and non-skeletogenic mesoderm) within the vegetal half of the embryo, we performed a series of in situ hybridizations on NSM regulatory genes, using Afi-alx1 as a landmark for SM and Afi-foxA for its outer boundary (Fig. 5, Additional file 1: Figure S6 and S7). We found no expression of NSM specification genes (gataE, gataC, and gcm) during blastula stage in A. filiformis (Fig. 5). At this stage, the SM is eccentric to the boundary delimited by Afi-foxA/Afi-hesC, establishing, thus, a third small mesodermal domain of unknown function (Additional file 1: Figure S7B and C). A few hours later, at mesenchymal blastula, once the SM cells ingress into the blastocoel, Afi-gataE and Afi-gataC are expressed in the entire vegetal plate (Fig. 5) along with Afi-hesC (Additional file 1: Figure S7) and other mesodermal genes (i.e., tbr, ets1/2, tgif, erg, hex, and delta). In sea urchin, Alx1 represses the NSM driver gene gcm in the SM lineage to ensure spatial separation of these two types of mesoderm. The absence of expression of Afi-gcm in brittle star (confirmed both with WMISH Fig. 5, and QPCR, Fig. 1b) makes this network linkage unlikely to exist. 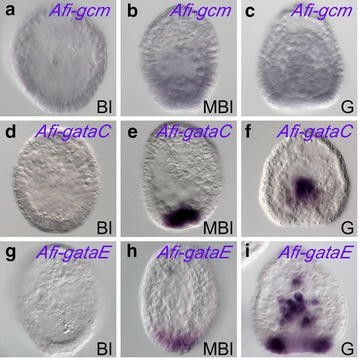 The late expression of Afi-gataE and Afi-gataC also suggests that NSM specification and patterning might occur at later stages compared to sea urchin. Cell specification is not a single-step process and several genes contribute to different aspects of this biological process emphasizing the importance of studying the dynamics of regulatory states. Therefore, we built a cellular resolution map (Fig. 6b) of the different mesodermal regulatory states up to mesenchyme blastula stage integrating all presented data. Our analysis revealed that (1) only Afi-pplx and Afi-delta have localized expression in a group of cells already visible by the end of cleavage stage (Fig. 2, Additional file 1: Figure S5). (2) Most of the mesodermal genes, including the SM genes, start their zygotic expression around early blastula stage (12 hpf), suggesting that the initiation of mesoderm specification might occur at this stage (Fig. 1b). (3) After hatching, a cohort of regulatory genes is expressed in all mesodermal cells and likely specifies a pan-mesodermal state. These are Afi-tbr, Afi-ets1/2, Afi-tgif, Afi-hex, Afi-pplx, and Afi-delta. (4) At this stage, a unique combination of transcription factors characterizes at least three distinct mesodermal domains (Fig. 6b, light green). An SM domain marked by the expression of Afi-alx1, Afi-jun, Afi-nk7, and Afi-erg (Fig. 6b, dark green). A small domain expressing only the pan-mesodermal genes Afi-tbr, Afi-ets1/2, Afi-tgif, Afi-hex, Afi-pplx, and Afi-delta (Fig. 6b, light green), and lastly, a one cell-wide ring of overlap between Afi-foxA and Afi-hesC and the pan-mesodermal genes (Fig. 6b, light green with blue dots). Additionally, expression of Afi-foxA and Afi-hesC spans towards the presumptive endoderm (Fig. 6b, blue). (5) By mesenchyme blastula, the SM and the NSM are now completely segregated although both express pan-mesodermal genes. The SM is now composed of mesenchymal cells, which have ingressed into the blastocoel and express Afi-alx1, Afi-nk7, and Afi-jun as distinctive markers. The NSM remains in the vegetal plate of the blastula epithelium and is distinguished by the expression of Afi-hesC, Afi-delta, Afi-hex, Afi-tgif, Afi-gataC, and Afi-gataE. Understanding the molecular basis of evolutionary changes to GRNs resulting in the gain or loss of specific complex characters is a fundamental question in biology. The depth of knowledge of the molecular mechanisms for endomesoderm specification in different echinoderm classes [7, 8, 11] provides an exceptional opportunity to unravel differences and similarities in GRN architecture responsible for evolution of cell type and complex morphological structures. In this study, we fill an important gap left open in echinoderm comparative GRN studies, by analyzing the dynamic of regulatory states taking place during the development of brittle star mesoderm. In the pluteus larvae of sea urchins and brittle stars, the elaborated mineralized skeleton is formed by a sub-population of mesodermal cells specifically expressing the transcription factors alx1 and jun. Our developmental observations in A. filiformis show that these skeletogenic cells ingress as mesenchymal cells into the blastocoel before gastrulation, similarly to what has been already described for another ophiuroid species (Ophiopholis aculeata; ) and to euechinoid, rather than cidaroid sea urchins. Despite the morphological similarities of the skeleton and its mode of development in both echinoderm classes, several differences are revealed by our high-resolution multi-gene expression analysis (summarized in Fig. 6), which have important implication in GRN architecture. Foremost, side-by-side comparison of brittle star and sea urchin mesodermal regulatory states (Fig. 6) reveals that many differences in network architecture are apparent at the level of the initiation of the expression of skeletogenic genes, and at the level of the regulation of the differentiation gene batteries. This is consistent with the “hourglass” model of evolution [51, 52] in which evolutionary plasticity of network linkages differs depending on their position in the network hierarchy (early, mid or late). Our analysis also shows that gene duplication, protein function diversification, and cis-regulatory evolution took place over 480 million years of evolution to shape the larval skeletogenic networks as we see them now in the echinoderm classes which develop pluteus-like larvae. Skeletogenesis is the most studied developmental program in echinoderms including both sub-classes of sea urchin and for this reason provides an exceptional opportunity for multi-element comparison. In euechinoids, the most similar developing embryo to A. filiformis, the skeletogenic program is unlocked at cleavage stage by the action of the pmar1/hesC DNG. A potential ortholog of the sea urchin Pmar1 has been identified in A. filiformis (Afi-pplx) and in another brittle star species ; however, our cross-species analysis revealed functional non-equivalence of these transcription factor genes. Important gene duplication and protein function diversification events likely occurred to shape the sea urchin Pmar1 into a potent repressor of the DNG. Our protein phylogeny (Fig. 2a, Additional file 1: Figure S3) supports a likely ancient duplication of the phb1 gene, which led to the emergence of the pplx/pmar1 class in the last common ancestor of sea urchins and brittle stars, ~480 Mya. The relaxed selective pressure on the new duplicated pplx/pmar1 gene may have then allowed the diversification of the protein function by the acquisition and loss of short linear protein motifs (e.g., eh1), which are reported to be easily evolvable . The presence in all euechinoid species analyzed so far of several almost identical copies of pmar1 (Fig. 2a) arrayed in tandem in the same fragment of DNA (Sea Urchin Genome Project BAC Clones #170H13 and #020N20; GeneBank AC131562) suggests a further gene duplication event that possibly occurred concomitant with the emergence of the stereotypical quartet of micromeres present at the vegetal pole of the euechinoid embryo. The ancient duplication hypothesis is further supported by the striking similarity of spatio-temporal expression pattern between the Spu-pmar1 and the Afi-pplx (Fig. 2) gene, both expressed transiently at the vegetal pole of the early embryo. The pmar1/pplx gene type has so far been identified only in euechinoids and ophiuroids, possibly due to limited sequence resources available for other echinoderm species. Most publicly available data consist of transcriptome data of specific developmental stage(s) and do not sample early embryonic stages, when the pmar1/pplx gene is likely to be expressed (Fig. 2c). An exception is given by the draft of the sea star P. miniata genome , for which we can state confidently that no pmar1/pplx gene is present, although a clear phb1 gene has been identified (Fig. 2a). Our evolutionary scenario in light of recent echinoderm phylogeny [22–25] implies the loss of the pmar1/pplx gene at least in the Asteroidea lineage, although we cannot exclude the alternative hypothesis of independent duplication of pmar1 and pplx genes from a phb1 ancestor gene, respectively, in the Echinoidea and Ophiuroidea lineages. Both scenarios, however, pinpoint the high evolutionary plasticity of the pmar1/pplx gene and its role in the GRN underlying echinoderm mesoderm specification. High-resolution expression data of Afi-hesC and its immediate targets (Afi-ets1/2, Afi-tbr, Afi-delta) integrated with the echinoderm phylogeny allow the reconstructing of the nature and timing of the molecular changes occurred to set up the DNG responsible for the precocious specification of skeletogenic fate in micromeres in the euechinoid lineage (Fig. 3b). As laid out in Fig. 6, the predicted changes in cis-regulatory apparatus of ets1/2, delta, and tbr to become negatively regulated by HesC, and for the hesC gene to become repressed by Pmar1 , likely occurred in the euechinoid lineage once split from the cidaroid sister group. Support for this is given by the pencil urchin (cidaroids) hesC, the expression of which is not consistent with a function in a DNG at the top of the skeletogenic regulatory cascade [11, 18, 19]. In cidaroids as well as in asteroids  and ophiuroids (this study), hesC is co-expressed with its sea urchin immediate targets, ets1/2, tbr, and delta, which are expressed in all mesodermal cells and not only restricted to the skeletogenic lineage as in sea urchin (Fig. 5b). This implies that ets1/2, tbr, and delta in A. filiformis, as well as other classes, cannot be directly repressed by HesC and that a different mechanism must exist to drive their precise spatial expression pattern. A possible molecular mechanism emerged recently in sea star, where expression of these genes was shown to be regulated by sustained high levels of nuclear β-catenin . It is interesting to notice that the expression pattern of hesC is dramatically different in the species so far studied (and belonging to different classes) ranging from a ubiquitous expression excluded only from SM (euechinoids), or excluded from the vegetal ectoderm (asteroids and Prinocidaris baculosa cidaroid) to a restricted ring of cells in the vegetal half of the embryo (ophiuroids and E. tribuloides cidaroid) highlighting high evolutionary plasticity of the hesC cis-regulatory apparatus. Other substantial differences between the sea urchin and the brittle star are identified at the periphery of the skeletogenic network, at the level of the downstream differentiation genes, which in A. filiformis are not regulated by the TF Afi-FoxB and Afi-Dri either in the larva or in the adult ( and unpublished data). While foxB expression only in skeletogenic cells of euechinoid embryos supports a co-option of this gene in the larval skeletogenesis of echinoids, the absence of dri function in the brittle star skeleton GRN is specific to ophiuroids, given the fact that in both sea urchin and sea star dri is expressed in association with skeletogenic cells . Extensive rewiring at the level of cis-regulatory apparatus of several differentiation genes as well as foxb and dri themselves must have occurred accordingly to change the expression in the two classes of echinoderms. The precise spatio-temporal expression of a developmental gene is controlled by its own cis-regulatory apparatus, which is capable of integrating multiple inputs (i.e., transcription factors) present in a given combination (regulatory state). Therefore, if no changes occur in the inputs or in the cis-regulatory apparatus of a developmental gene during evolution, the expression pattern of orthologous genes will be maintained in related species. While our experimental approach cannot demonstrate the existence of linkages, it can certainly exclude their existence. Therefore, from the comparison of different spatial or temporal expression of orthologous genes in the two species, we can infer regulatory differences in the skeletogenic GRN of sea urchin and brittle star, given an identical regulatory state. Conversely, we presume, in the absence of perturbation data in A. filiformis, that when similar expression patterns are observed, the regulatory functional connections are conserved with sea urchin embryos that produce skeleton. For instance, we cannot address if the alx1 gene is regulating skeletogenic genes, as it does in sea urchin, or if it regulates other mesodermal genes as in sea star early embryo. Therefore, we might actually underestimate the amount of architectural differences between the two networks in the two classes of echinoderms. Figure 6b highlights the differences of network linkages, based on the high-resolution expression data here reported, compared to the S. purpuratus GRN model (Fig. 6a, ). Although, functional studies are needed for validation, expression of alx1 and jun at blastula stage, along with the pan-mesodermal regulatory genes ets1/2, tbr, tgif, hex, and erg, seems to be a common feature of the initial state of the skeletogenic program in both euechinoid and brittle star, as well as in sea cucumbers , which produce small mineralized spicules. This set of regulatory genes likely constitutes the right combinatorial code necessary to drive echinoderm larval skeletogenesis. A direct consequence of this hypothesis is that many of the downstream genes should be directly regulated by Alx1 and other mesodermal TFs in a combinatorial fashion, and thus be expressed long before the mineralized skeleton is formed. Indeed, in sea urchin as well as in brittle star (Fig. 1) several mineralization genes are expressed already at blastula stage, and genome wide analyses identify alx1 and ets1/2 as major controllers of these differentiation genes [16, 17]. Furthermore, these two transcription factors are expressed in the plesiomorphic adult skeleton of brittle star, sea star, and sea urchin [21, 47]. Independent or common evolution of larval skeleton? Our data reveal substantial differences in the regulatory programs underlying the development of mineralized skeleton in the morphologically similar pluteus larvae of sea urchins and brittle stars. Adult calcitic endoskeleton is a plesiomorphic character of echinoderms apparent also in ancient extinct species . It has been proposed that the sea urchin larval skeleton evolved by a simple co-option of an ancient adult skeletogenic GRN module , consistent with the expression of many skeletogenic regulatory gene also in adult skeleton, as already discussed. What about the ophiuroid larval skeleton? Did it originate with the same co-option event of sea urchin or with an independent co-option event? To address this question, two key aspects need to be considered: (1) the phylogenetic relationship of the five echinoderm classes; (2) the developmental specific network nodes rather than the regulatory genes expressed also in adults and being part of an ancient skeletal GRN module. The recent availability of transcriptomic and genomic data from several echinoderm species sprung several phylogenomic analyses based on large dataset including representative of all echinoderm extant classes [22–25]. All these extensive molecular phylogenies converge on the consensus tree, in which echinoderms and holothurians form a distinct clade (Echinozoa) from the ophiuroids and asteroids clade (Asterozoa) and the crinoids are sister taxa to these four classes (Eleutherozoa). These new studies bring back the divergence between Echinozoa and Asterozoa roughly 480 Mya . If the larval skeleton originated independently, the co-option of the adult skeletogenesis GRN module would have occurred during brittle star larval evolution using different developmental genes compared to sea urchin. In fact, many sea urchin-specific skeletogenic developmental genes, such as foxb, dri, and mitf are not expressed in cells (or not expressed at all) that also express skeleton matrix genes in A. filiformis, and therefore, it is conceivable that they are not part of the larval skeletogenic GRN. On the other hand, in the case of a single co-option event (common evolution), the role of at least some developmental only genes should have been conserved (e.g., pmar1, hesC, and foxB) between brittle star and sea urchin. In this case, the larval skeleton would have originated only once at the base of the Eleutherozoa and would have been lost in asteroids and reduced in holothurians. Despite all, the ancient split (roughly 480 Mya) of all classes and their long branches of independent evolution make a clear conclusion difficult. Importantly, regardless of common or independent evolution, it is likely that the co-option happened through the same genes alx1 and jun and thus at the same tier of the GRN in both echinoderm classes. This implies that the cis-regulatory control initiating the expression of alx1, and possibly jun, in a subset of mesodermal cells should reveal the exact evolutionary nature of sea urchin and brittle star co-option event and it would be a prime focus for future investigations. In conclusion, assuming that the subset of mesodermal cells is indeed skeletogenic, our study establishes A. filiformis as a key developmental system for a detailed comparative analysis of the gene regulatory networks acting in the skeletogenic mesoderm in distantly related echinoderms. Our high-resolution gene expression study identifies differences and similarities in the mesodermal regulatory states between A. filiformis and euechinoids. These have important implications for the GRNs underlying mesoderm in brittle stars and set up a clear framework for future functional experiments in A. filiformis. Independently of this, our work brings new evidence to a long debated issue on the evolutionary origin of echinoderm larval skeleton and clarifies specific mechanisms of GRN diversification, which see not only cis-regulatory elements evolution, but also gene duplication and protein function diversification as equally important mechanisms. Embryo cultures were set up as previously described in . cDNA synthesis and QPCR for high-resolution time-courses were done as described in  using Afi-16S as internal standard. WMISH were performed as described in  with the following changes: pre-hatching embryos were treated with 1 mg/ml Trypsin (Sigma) for two hours before fixation; hybridization temperature of 55 °C. FISH were performed as described in , using the hybridization buffer described in  and hybridization temperature of 55 °C. Cell counts were estimated using confocal z-stacks with the Cell Counter plugin part of Fiji/ImageJ on several embryos. Microinjections were performed as described in . All synthetic mRNAs are described in Additional file 1: Figure S4; and they were injected at equimolar concentration, for detailed procedures see Additional file 2. PO conceived the project, performed injection in S. purpuratus, analyzed, and interpreted the data and wrote the manuscript. DVD acquired data, performed bioinformatics analyses and qPCR, in A. filiformis. Moreover, DVD analyzed data and wrote the manuscript. DVD, AC, and JS collected embryonic samples, performed gene cloning, and performed in situ hybridizations in A. filiformis. OOM and SD contributed with unpublished essential data, reagents, and embryonic samples. All the authors read and approved the manuscript. The authors wish to thank Max Telford, Libero Petrone, Patrick Toolan-Kerr, Avi Lerner, and the anonymous reviewers for constructive comments on the manuscript; and Pok Wai (Prudence) Liu, Wendy Hart, Euthymios Kragkaris and Pantelis Nicola for experimental assistance. We wish to thank also the staff at the Sven Lovén Centre for Marine Sciences for their support. This work was supported by the EU FP7 Research Infrastructure Initiative ASSEMBLE (ref. 227799), UCL System Biology, and KVA funds SL2015-0048 from the Royal Swedish Academy of Science. AC was supported by a Wellcome Trust PhD fellowship. 13227_2015_39_MOESM1_ESM.pdf Additional file 1. Additional figures and tables; Contains figures and tables supporting data in the main text. 13227_2015_39_MOESM2_ESM.docx Additional file 2. Extended methods; Contains a detailed description of methods used to conduct study.